Video is the defining medium of the 21st century, thanks to the rise of the internet. But its origins go back way further, to the late 1960s, when the first portable video devices emerged. It was a watershed moment in history—and our short documentary explains why. The history of video is often overshadowed by its more familiar cousin, film. The two are intertwined, and often confused. But video possesses unique characteristics that distinguish its significant influence in how media, art, and visual culture at-large has evolved. In our short documentary, Untethered: The Birth of Video, we sat down with artist, writer, and professor Tom Sherman to discuss the history of video, and how artists in the late 60s and early 70s were able to harness the technology in a flurry of weird and creative behaviors that still resonate in the millions of internet videos being shared today. 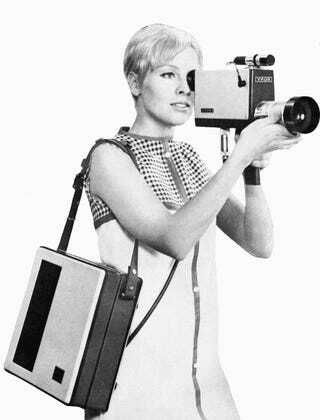 It all started with Sony, which developed a portable video camera system—the portapak—in 1967. Prior to that, video technology was only accessible to large institutions and corporations that could afford the huge equipment and studios. Such a reality is hard to imagine today, given the utter ubiquity of video recording devices. These portapaks were a portal into a new world. They could be carried anywhere. They were cheap (around $1500) and easy to use—despite consisting of manually threaded reel-to-reel tape housed inside a heavy VCR-like recorder that was worn over the shoulder. The mechanisms were fragile and the vidicon—the tube unit that generated the image—was so sensitive to bright light that you had to literally put the camera in the freezer to rescue the device from the occasional burn-in. But it was that immediacy that drew artists to video technology early on, which they used to document ideas and carry out political activism, and which they hoped would disrupt the influence of broadcast television. The videos that were made at the time are washed out and blurry, but rich in unbridled experimentation. 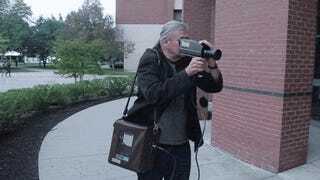 Whether it was Vito Acconci beckoning to an imaginary off-camera companion, or Peter Campus toying with the visual trickery of chroma-key, it is easy to see how early artist’s tapes echo the way people express themselves with video today. Journalists and artists used this new tool just like they use the internet today. In some ways, it was video that prepared us for the online world. What artists back then could not have foreseen, of course, was the very near future, a time when nearly everyone has access to video cameras 24 hours a day, and can experiment, speak out, and—through the internet—distribute their creations to an audience of millions.